Little Albert wanted bananas, but Mother didn't have the money. 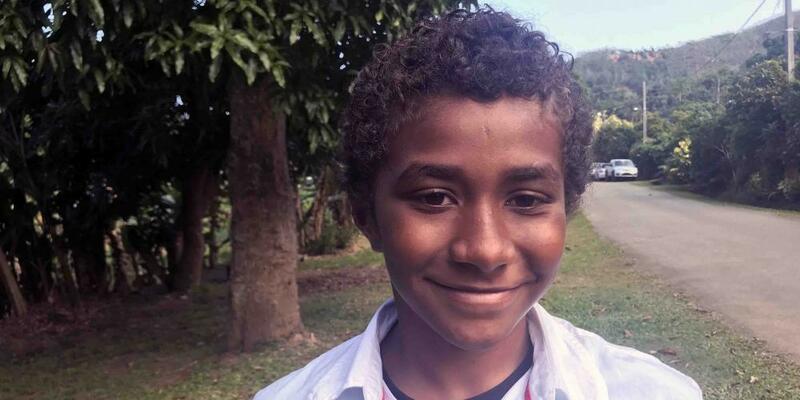 Eleven-year-old Albert Andrea was hungry when Mother picked him up at school in Noumea, capital of New Caledonia in the South Pacific. He had only eaten half his lunch because he didn’t like the other half — spinach. Mother also wanted to go to the market to buy parsley and spring onions to make tuluk, a traditional Vanuatuan dish made of cassava and coconut milk. But she only had enough money to buy the ingredients. Albert, however, couldn’t forget the banana. He was hungry! As they drove to the market, he spoke about how nice it would be to have a banana. Mother was happy to hear the prayer, and she smiled. Arriving at the outdoor market, Mother told Albert to wait in the car while she shopped for parsley and spring onions. Albert waited as long as he could, but the car grew terribly hot in the bright sun. He got out to wait. The first thing that he saw was a man selling bananas. He was eating one of the bananas. Someone walked up to Albert. The boy turned and saw a white man wearing white clothing and a white shawl over his head. He held a bunch of yellow bananas. “Bye-bye, Albert,” the man said. Albert sat inside the car and peeled a banana. It was nice and ripe and soft. Just perfect! When Mother returned, she was surprised and worried to see Albert eating bananas. “Where did you get those bananas?” she asked. “From a man in a white shawl,” Albert said. Mother and Albert looked, but they couldn’t find the man. Tears filled Mother’s eyes as she realized that Jesus had answered Albert’s prayer. She asked whether Albert had thanked God. Albert believes that the man in white was an angel. Albert says God has answered many prayers. Albert lives near the ocean, and he is saving money to buy a speargun, so he can catch and sell fish to help his parents. He is earning money by catching fish with a fishing rod. One day, as Albert was fishing, Mother walked by and saw a big fish in the ocean. “Wow, that’s a big fish!” she said. He threw out his fishing line and immediately caught the fish. On another day, Albert told Mother before school that he wanted scoubidou, colorful plastic threads that children weave into keychains. “Mommy, I want you to buy scoubidou for me,” he said. Mother, who works as a housekeeper, cleaning someone’s house, said she only had enough money for bus fare to go to work. The boy went to the hall and spotted the basket. Part of a 2016 Thirteenth Sabbath Offering helped build two children’s Sabbath School classrooms on Maré, an island in New Caledonia. Thank you for your Sabbath School mission offerings that help children learn about God.